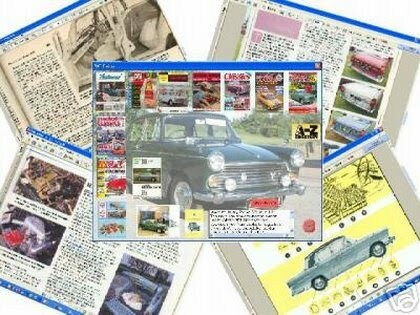 Over the years I've collected many books and magazines about the Morris Oxford and Farina family. Storing and keeping them accessible was always a problem. Until I had the idea of scanning the best bits and keeping them on my PC! This grew into a collection that fitted nicely on to a CD ROM, and I was able to produce a simple menu page to link everything together. The articles are stored in the universal Adobe PDF format and the file below will give you an idea of how they look (click the title not the picture). The articles have been expertly scanned from original magazines, brochures and books dating back to 1959. Many are out of print and obtainable only from collectors, but there are also modern Buyer's Guides to help keep these great classics going. Hundreds of pounds worth of publications and many hours have gone into the production of this CD set. Insert the CD in your PC and a menu presents the articles in a very user-friendly manner; simply click on the magazine cover and read the article. A to Z Classic Car Directory- a fantastic list of suppliers for finding those obscure parts. Jack Brabham's Car Care Guide for the Austin A60 - a Service Guide for your Farina. BMC Oxford V Service Manual - 240 pages of BMC's own workshop manual, fully indexed and searchable on your PC. Enter a phrase like "wheel bearing" and go straight to the article. Print out the page, get it oily and throw it away! Archive film of the Earls Court London Motor Shows from 1959 to 1969 - Fascinating viewing and guaranteed to bring a smile to your face! I also have DVD's of fascinating documentaries about Farinas and BMC cars.